Download "Commercial Ordering for Appraisal Firewall A Guide for Managers"
2 How Commercial Ordering Works ACCELERATE YOUR APPRAISAL PROCESS WITH THE TECHNOLOGY The commercial appraisal process is similar to the existing residential piece, with the key difference being that Managers or Rotation Managers manually choose a group of appraisers to bid on the commercial appraisal order. Selected appraisers submit bids based on the order details. Once bids are received, Managers or Rotation Managers choose the best appraiser for the job, and accept the appraiser s bid to assign the order. Managed Users under Rotation Managers can still place anonymous orders, and Rotation Managers can still see everything that happens with the order. 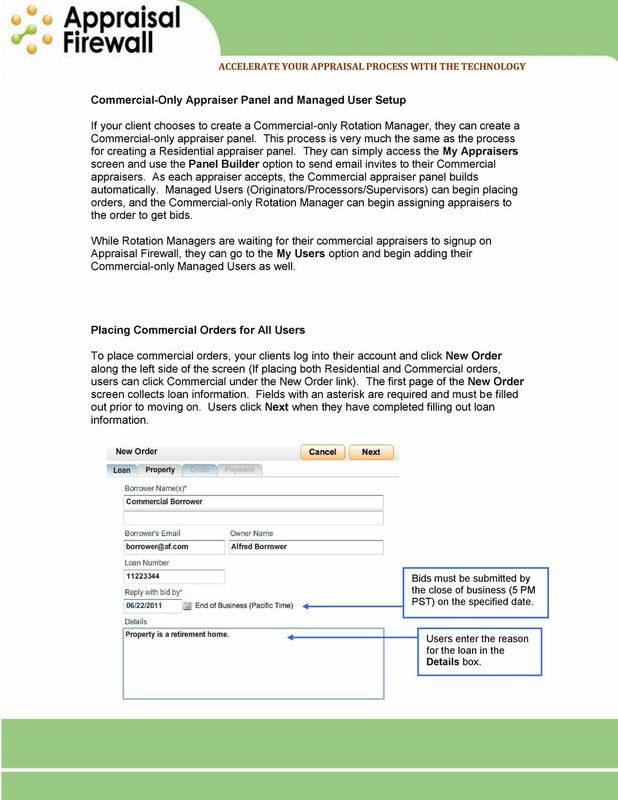 It is very common for lenders to have a separate Rotation Manager for commercial orders. Appraisal Firewall supports both situations: if you have a client that has one Rotation Manager that manages both Residential and Commercial you can set them up this way. If you have a client that has separated Residential and Commercial between two Rotation Managers, the client can simply signup a new Rotation Manager for Commercial and utilize Commercial-only appraisers and Managed Users. 3 Commercial Appraisal Setup for Managers Fees Commercial appraisal fees can be set up at the manager level, or be modified on a per company basis. Note that entering a fee onto the screen below does NOT enable clients for Commercial. 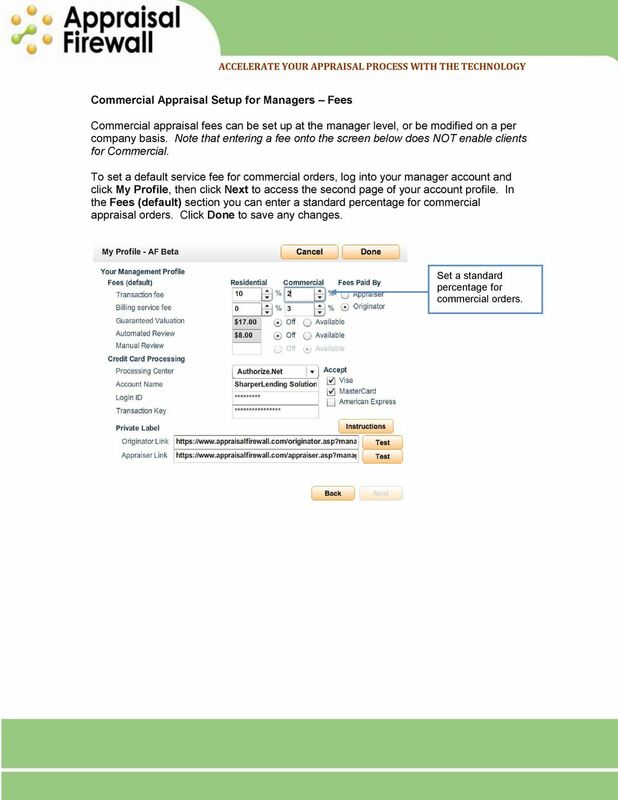 To set a default service fee for commercial orders, log into your manager account and click My Profile, then click Next to access the second page of your account profile. 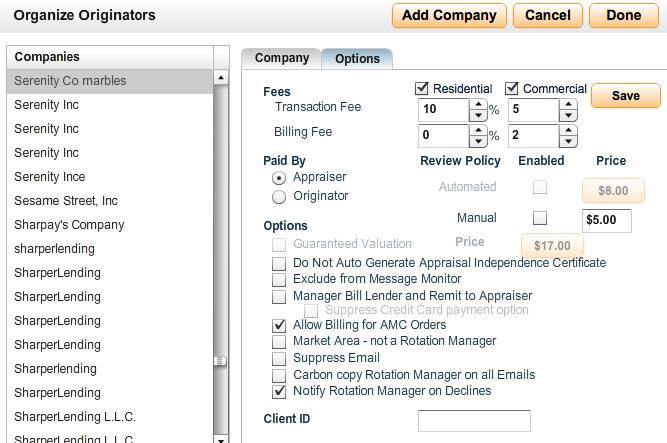 In the Fees (default) section you can enter a standard percentage for commercial appraisal orders. Click Done to save any changes. Set a standard percentage for commercial orders. 4 Commercial Setup for Managers Enabling a Client for Commercial Lenders can set up their own accounts to do commercial appraisals, or as a manager, you can enable a specific company to do commercial orders. In addition, you can modify the commercial ordering fees on a per company basis. To do this, click the Organize link, click the company you would like to enable for commercial, and select the Options tab. Place a checkmark in the Commercial checkbox to enable this client and their users to place commercial orders. You can create a specific commercial appraisal percentage fee to be applied only to this company as well. 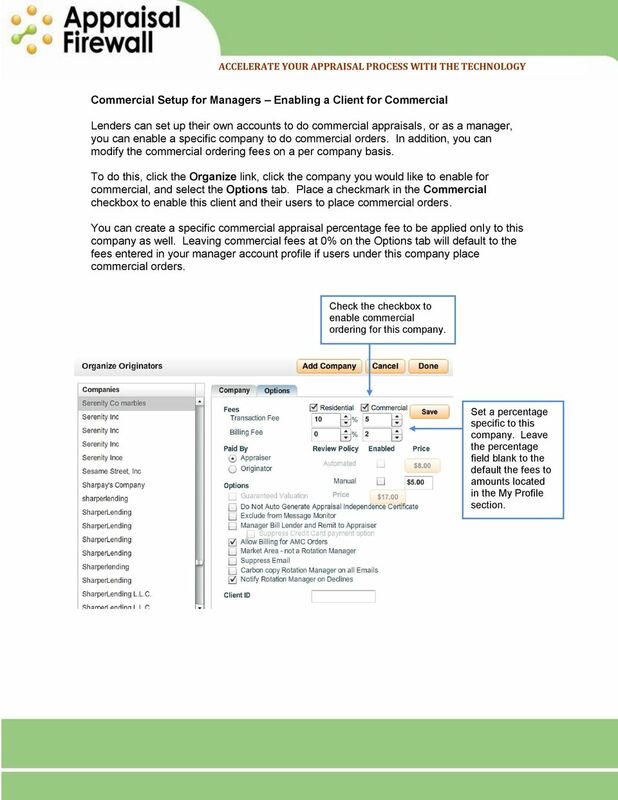 Leaving commercial fees at 0% on the Options tab will default to the fees entered in your manager account profile if users under this company place commercial orders. Check the checkbox to enable commercial ordering for this company. Set a percentage specific to this company. Leave the percentage field blank to the default the fees to amounts located in the My Profile section. 5 Commercial Setup for Your Rotation Managers ACCELERATE YOUR APPRAISAL PROCESS WITH THE TECHNOLOGY Although it is recommended that a company create a new Rotation Manager account to process commercial appraisals, an existing rotation manager account can be modified to enable commercial appraisal ordering along with residential appraisals. The setup process is largely the same for your lenders no matter if they create a brand new Rotation Manager exclusively for Commercial or utilize an existing Rotation Manager to do both Residential and Commercial. Your clients lender setup is done from their Profile screen no matter if they are signing up as a brand new Rotation Manager or enabling an existing account to do both Residential and Commercial. To activate commercial ordering, the Rotation Manager will log into their account and click My Profile, then click Next to access the second page of their account profile. In the My Role section, they can check the appropriate Appraisal Type checkbox to designate that they will be processing commercial appraisals only, or both residential and commercial. Clicking Done will save any changes. Rotation Managers need to log out and log back in to have the changes take effect. Once enabled, any managed users setup under this Rotation Manager can place commercial orders. Commercial Orders are routed to appraisers on the Rotation Manager s panel that have designated themselves as being able to perform commercial appraisals. 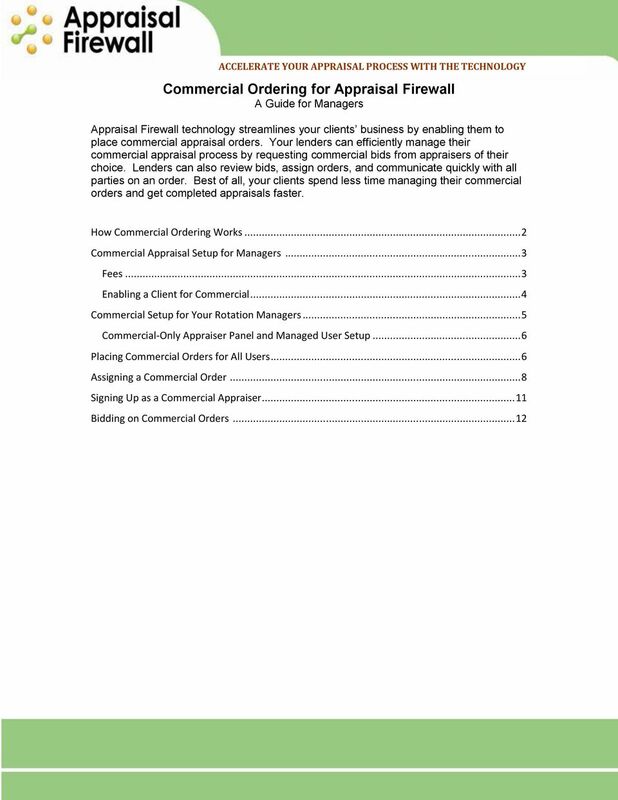 The commercial fees designated by you as manager are displayed here. These are sample fees only. 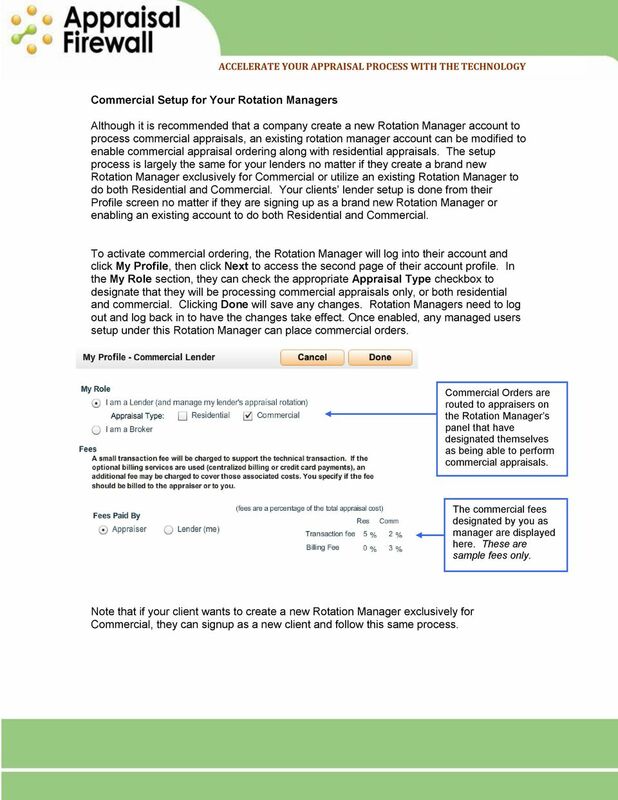 Note that if your client wants to create a new Rotation Manager exclusively for Commercial, they can signup as a new client and follow this same process. 6 Commercial-Only Appraiser Panel and Managed User Setup If your client chooses to create a Commercial-only Rotation Manager, they can create a Commercial-only appraiser panel. This process is very much the same as the process for creating a Residential appraiser panel. They can simply access the My Appraisers screen and use the Panel Builder option to send invites to their Commercial appraisers. 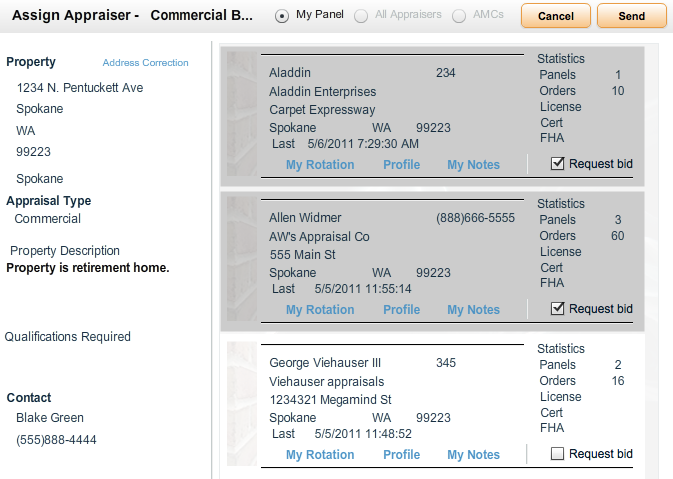 As each appraiser accepts, the Commercial appraiser panel builds automatically. Managed Users (Originators/Processors/Supervisors) can begin placing orders, and the Commercial-only Rotation Manager can begin assigning appraisers to the order to get bids. While Rotation Managers are waiting for their commercial appraisers to signup on Appraisal Firewall, they can go to the My Users option and begin adding their Commercial-only Managed Users as well. Placing Commercial Orders for All Users To place commercial orders, your clients log into their account and click New Order along the left side of the screen (If placing both Residential and Commercial orders, users can click Commercial under the New Order link). The first page of the New Order screen collects loan information. Fields with an asterisk are required and must be filled out prior to moving on. Users click Next when they have completed filling out loan information. Bids must be submitted by the close of business (5 PM PST) on the specified date. Users enter the reason for the loan in the Details box. 7 The Property tab collects specifics of the property to be appraised, including address, legal description, and contact information for admittance to the property. Users click Next to continue. 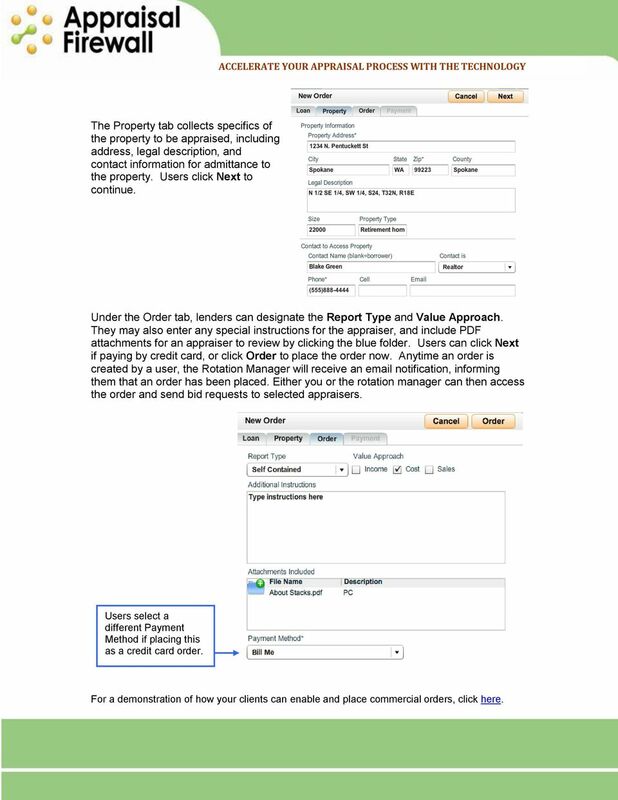 Under the Order tab, lenders can designate the Report Type and Value Approach. They may also enter any special instructions for the appraiser, and include PDF attachments for an appraiser to review by clicking the blue folder. Users can click Next if paying by credit card, or click Order to place the order now. Anytime an order is created by a user, the Rotation Manager will receive an notification, informing them that an order has been placed. Either you or the rotation manager can then access the order and send bid requests to selected appraisers. Users select a different Payment Method if placing this as a credit card order. For a demonstration of how your clients can enable and place commercial orders, click here. 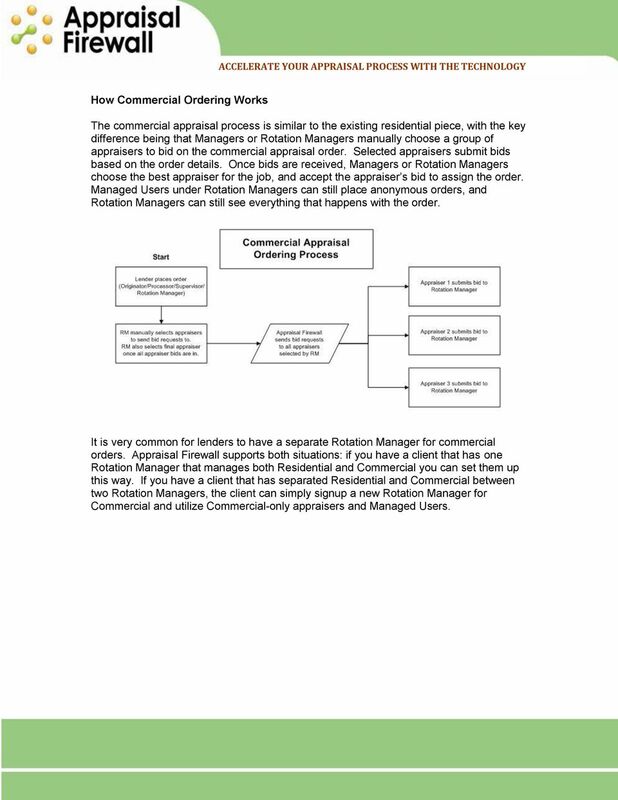 8 Assigning a Commercial Order Managers and Rotation Managers Appraisal Firewall notifies the Rotation Manager via when a new order has been placed. When you or the rotation manager log into your account, new orders are marked with a yellow New indicator and will be marked in a Requested status. You or the rotation manager must manually select appraisers you would like to request a bid from. Once bids are received, you or the rotation manager can select a price and turn time suitable to the lender s appraisal requirements. 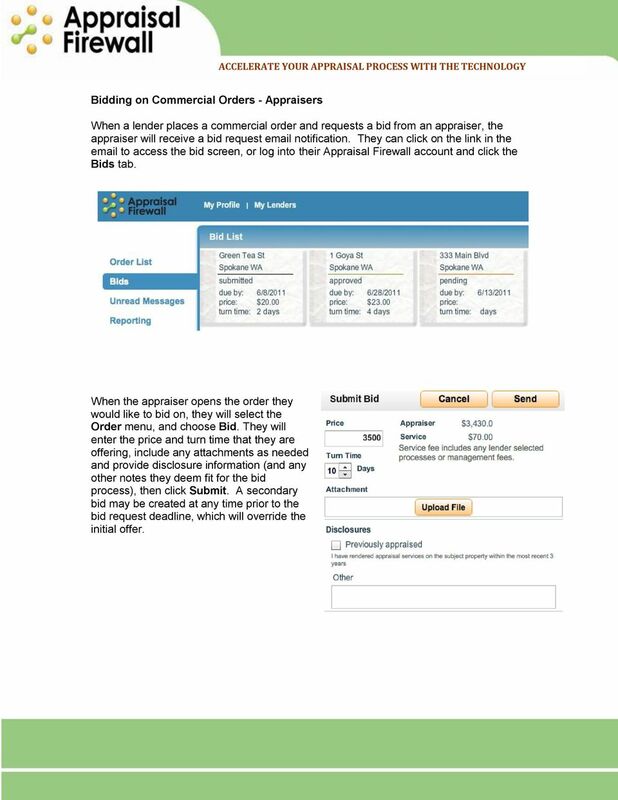 To route a new commercial appraisal order to appraisers to bid on, open the order, click the Order menu, and select Assign Appraiser. The appraisers that you can choose from have indicated on their Profile that they can perform commercial appraisals. 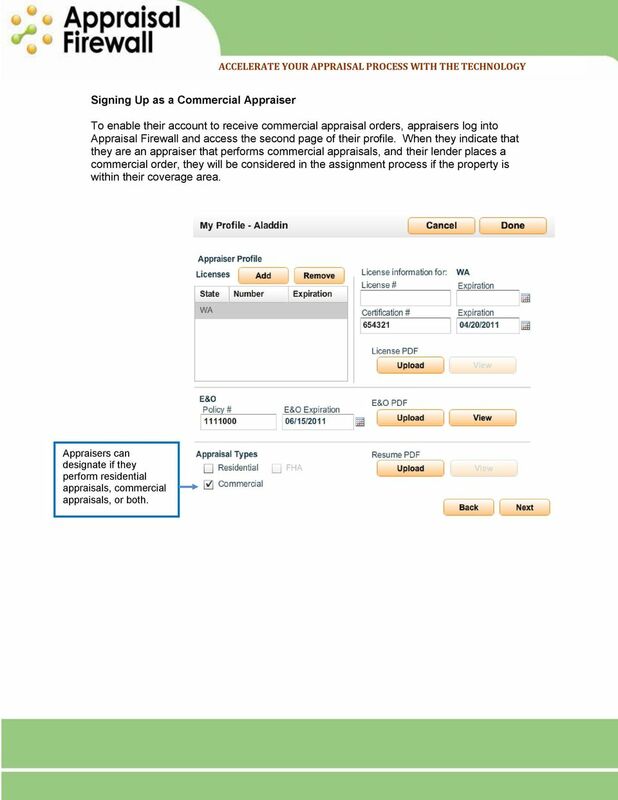 If you do not have any appraisers to choose from, make sure your commercial appraisers have signed up with Appraisal Firewall, and marked that they accept Commercial orders on their profile. 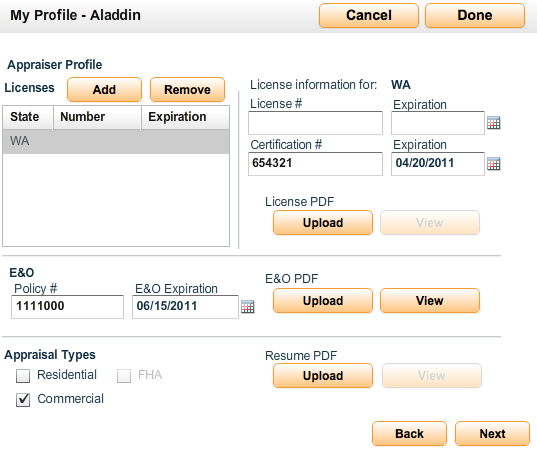 On the Assign Appraiser screen, check the Request Bid checkbox to select appraisers for this order, and click Send. 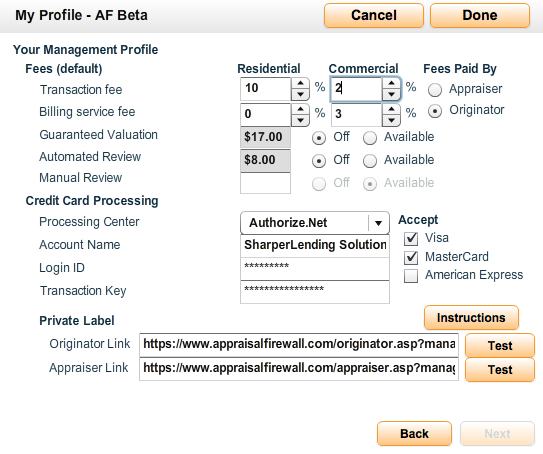 Appraisal Firewall sends bids to each marked appraiser with the order details they need to create a bid for your lender. Click the Request Bid box to submit the order to an appraiser for review. 9 When appraisers respond to the bid request, you can view their responses by going to the Order menu and selecting Review Bids. Managed users can view appraiser bids and send messages, but cannot see the identity of the appraiser. 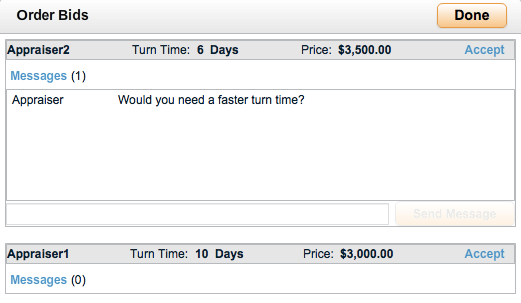 From the Order Bids screen, you can view appraisers expected turn times and bid prices. Click the blue Messages link to view any information the appraiser has updated the bid with. 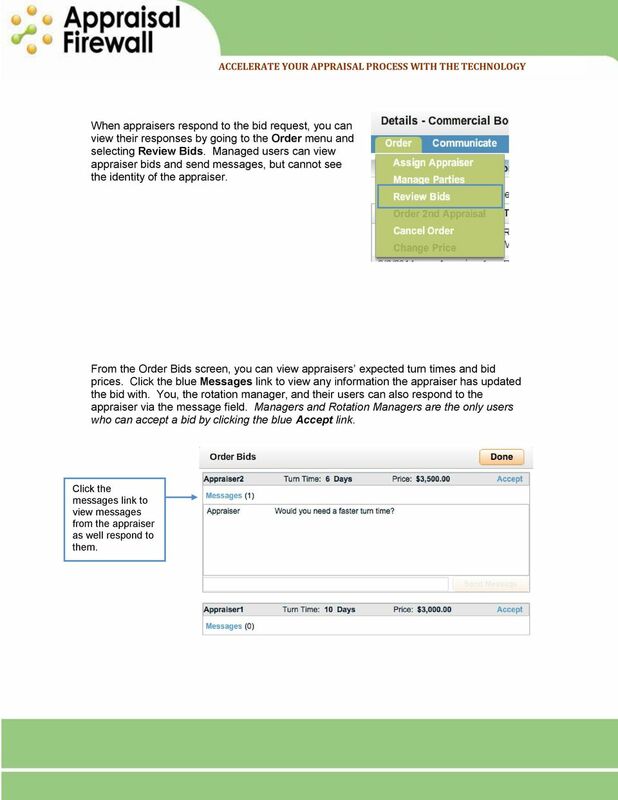 You, the rotation manager, and their users can also respond to the appraiser via the message field. Managers and Rotation Managers are the only users who can accept a bid by clicking the blue Accept link. Click the messages link to view messages from the appraiser as well respond to them. 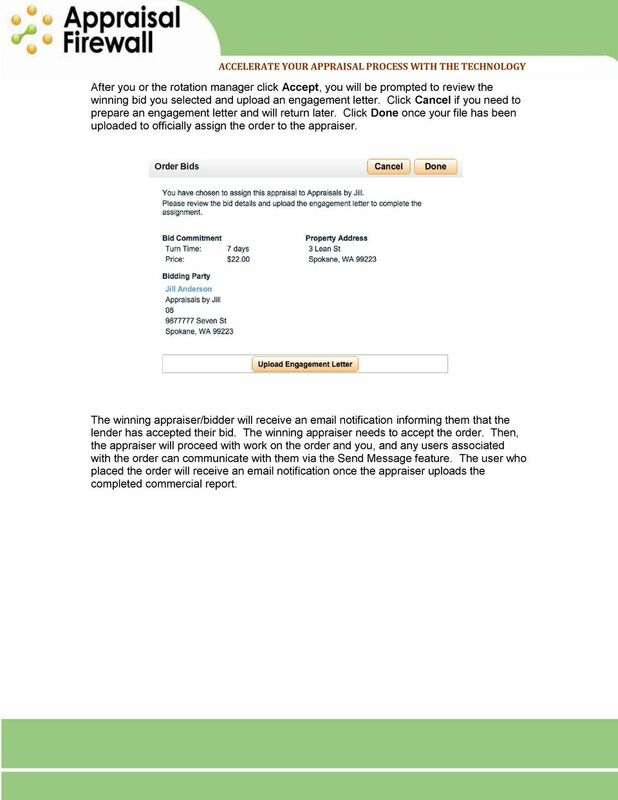 10 After you or the rotation manager click Accept, you will be prompted to review the winning bid you selected and upload an engagement letter. Click Cancel if you need to prepare an engagement letter and will return later. Click Done once your file has been uploaded to officially assign the order to the appraiser. The winning appraiser/bidder will receive an notification informing them that the lender has accepted their bid. The winning appraiser needs to accept the order. Then, the appraiser will proceed with work on the order and you, and any users associated with the order can communicate with them via the Send Message feature. 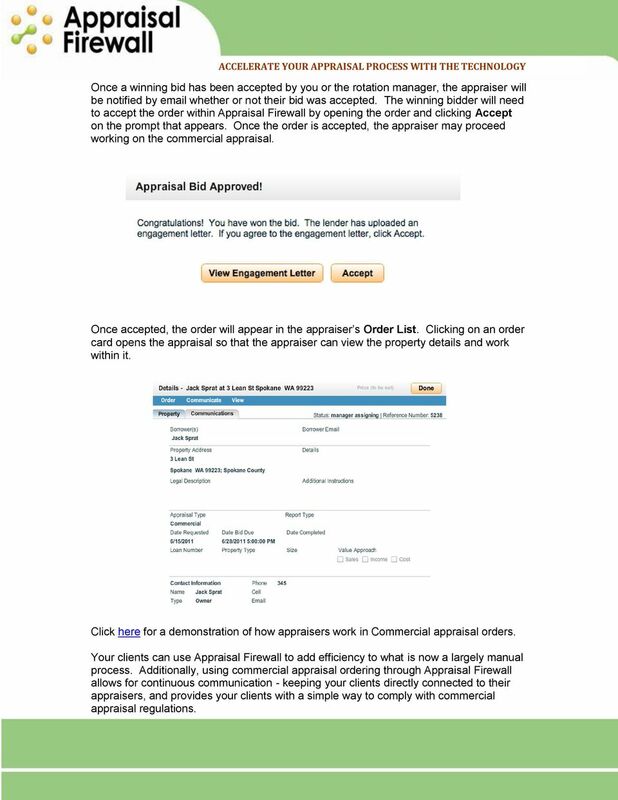 The user who placed the order will receive an notification once the appraiser uploads the completed commercial report. 11 Signing Up as a Commercial Appraiser ACCELERATE YOUR APPRAISAL PROCESS WITH THE TECHNOLOGY To enable their account to receive commercial appraisal orders, appraisers log into Appraisal Firewall and access the second page of their profile. When they indicate that they are an appraiser that performs commercial appraisals, and their lender places a commercial order, they will be considered in the assignment process if the property is within their coverage area. Appraisers can designate if they perform residential appraisals, commercial appraisals, or both. 12 Bidding on Commercial Orders - Appraisers ACCELERATE YOUR APPRAISAL PROCESS WITH THE TECHNOLOGY When a lender places a commercial order and requests a bid from an appraiser, the appraiser will receive a bid request notification. They can click on the link in the to access the bid screen, or log into their Appraisal Firewall account and click the Bids tab. When the appraiser opens the order they would like to bid on, they will select the Order menu, and choose Bid. They will enter the price and turn time that they are offering, include any attachments as needed and provide disclosure information (and any other notes they deem fit for the bid process), then click Submit. A secondary bid may be created at any time prior to the bid request deadline, which will override the initial offer. 13 Once a winning bid has been accepted by you or the rotation manager, the appraiser will be notified by whether or not their bid was accepted. 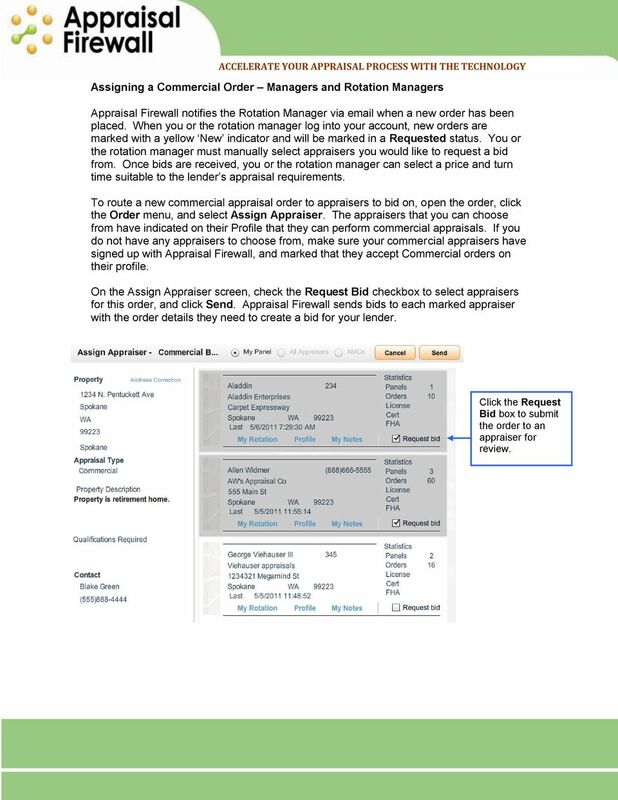 The winning bidder will need to accept the order within Appraisal Firewall by opening the order and clicking Accept on the prompt that appears. Once the order is accepted, the appraiser may proceed working on the commercial appraisal. Once accepted, the order will appear in the appraiser s Order List. Clicking on an order card opens the appraisal so that the appraiser can view the property details and work within it. Click here for a demonstration of how appraisers work in Commercial appraisal orders. Your clients can use Appraisal Firewall to add efficiency to what is now a largely manual process. Additionally, using commercial appraisal ordering through Appraisal Firewall allows for continuous communication - keeping your clients directly connected to their appraisers, and provides your clients with a simple way to comply with commercial appraisal regulations. Quick Reference Guide for MyTrack.com Project Tracking Website Your Project is On TRACK! ORIGINATE A REVERSE MORTGAGE USING. The correct steps and details on how to originate a reverse mortgage with Reverse Vision. Grade Entry for Instructors who can Approve Grades Instructors who are teaching and also have the ability to 'approve and post' grades in the system have the capability to enter AND approve their own grades. CodeNet Administrator s Guide Software version 4.0 Manual 1.0 revision 0 ZOLL Data Systems 2000-2007 by ZOLL Data Systems. All rights reserved. ZOLL Data Systems is a subsidiary of ZOLL Medical Corporation. In this tutorial I will be uploading multiple images to my ftp folder on my ktools site, and then add them using manager. How to upload images via ftp In this tutorial I will be uploading multiple images to my ftp folder on my ktools site, and then add them using manager. First thing I need to do is get all my images ready. Solidif US, Inc. A National Appraisal Company 701 Seneca Street, Suite 660, Buffalo, NY 14210 Phone 800-771-5246 Fax 716-558-2815 NEW APPRAISER GUIDE Copyright 2013 Solidifi US, Inc. All rights reserved.